Thomas Dunne Books, 9780312662561, 320pp. Adam Newman once had it all. But then he lost it. 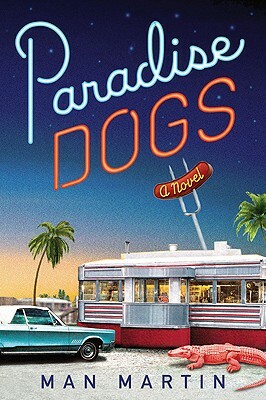 Now Adam yearns to reunite with his estranged wife, Evelyn, and recapture the Edenic life they once had running Paradise Dogs, the roadside hot-dog restaurant now legendary throughout central Florida. He has a few obstacles along the way. For starters, there’s his impending marriage to Lily. There’s also the matter of a quarter million dollars’ worth of diamonds that he mislaid, along with what appears to be a shadowy conspiracy that is buying up land around the Cross-Florida Canal (and which may or may not be a product of Adam’s alcohol-infused imagination). Despite his own troubles---and a brief stay in Chattahoochee---Adam looks to mentor his son, Addison, in the ways of love. Awkward, unsure, and employed as the world’s least accurate obituary writer, Addison pines for a beautiful and painfully earnest linguistic student but must compete for her attention with his older and more sophisticated half brother from Evelyn’s first marriage. Man Martin spent his childhood in Florida and Georgia and currently teaches high school English in Atlanta. He is the author of "Days of the Endless Corvette, "which won the 2008 Georgia Author of the Year Award for First Novel. Man Martin is the recipient of the Georgia Writers Association's Author of the Year for Fiction in 2012 for Paradise Dogs!